LIGHTING DESIGN SERVICE OFFERED – INCLUDING LEED PROJECTS, LOCAL AUTHORITY PROJECTS, ETC. 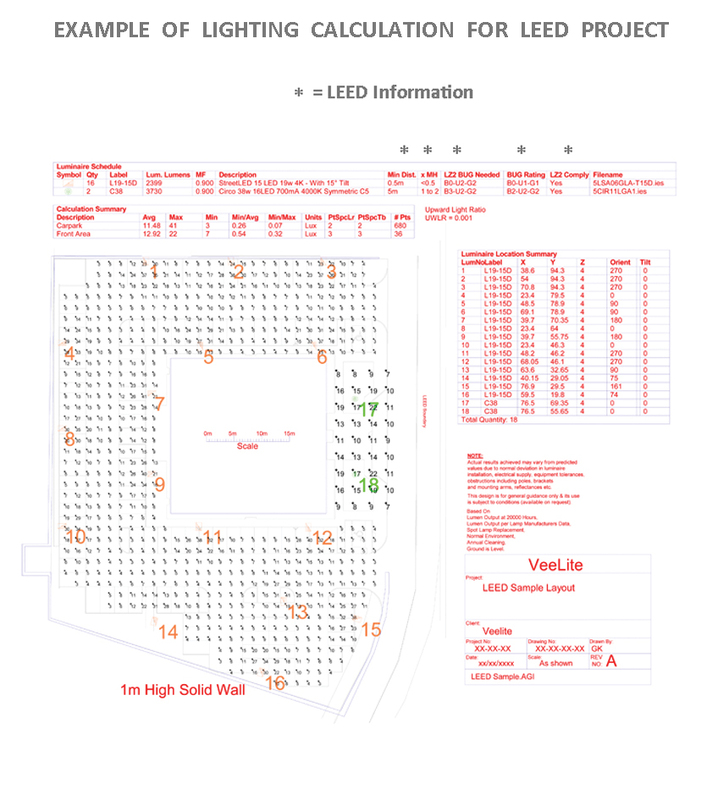 VeeLite offer a lighting design service to our customers for suitable Projects, to calculate light levels, quantity/type of luminaires needed, locations, etc. If you wish, we can offer the first calculation and issue photometrics so you can check or change this calculation afterwards. The customer would typically send us a Site layout as an Autocad drawing in dwg format*. We add the Luminaires and show lux levels on these drawings, together with other information and return to the customer. See example below. *If possible, do not send as an X-reference drawing and only include the minimum of layers necessary. Lighting calculations for large spaces is particularly suited for us as we have advanced Lighting Design/Calculation software ideal for large external sites. The Software allows lighting Calculations (in multiple) to be placed on a CAD background, customisation of calculation grids and observer positions, changes in elevations as is typical in Motorway intersections, etc, reflectances which are required in Tunnels and Underpasses etc, Internal Room calculations with customisation of room shapes, etc. Many of these Programs work on slightly different basis. For example, a Veelite Luminaire imported into 1 Program may be pointed North (0°) but the same Luminaire imported into another Program may be pointed (orientated) East (90°). Usually these type of differences are easy to notice as long as the User is aware. Photometrics on our Website for download are in IES format. These should work in most calculation programs. If not, we may be able to convert to other formats. Photometrics on the website should be considered a guideline. LED/LED module manufacturers are constantly changing their product. In August 2016 for example, the lumen output was increased on all our 80w photometrics, but the energy usage decreased to 70w. Literature, website data, Product construction, photometrics etc may not reflect these changes for some time or at all. All computer programs work on different assumptions and have limitations. It is not an exact science. After producing your own calculations, please send to us for checking. We can advise if we are aware of a better solution as well as checking for any errors in the calculation/photometrics/ etc. If Specifying Lights, please ensure the description is as per the photometrics used in the calculation (Beam Angles, Lumens, Wattage, ra/CCCT etc). We only show a few photometrics on the website. Please request photometrics that are not shown. Email: info@light.ie or Telephone +353-51-875399. 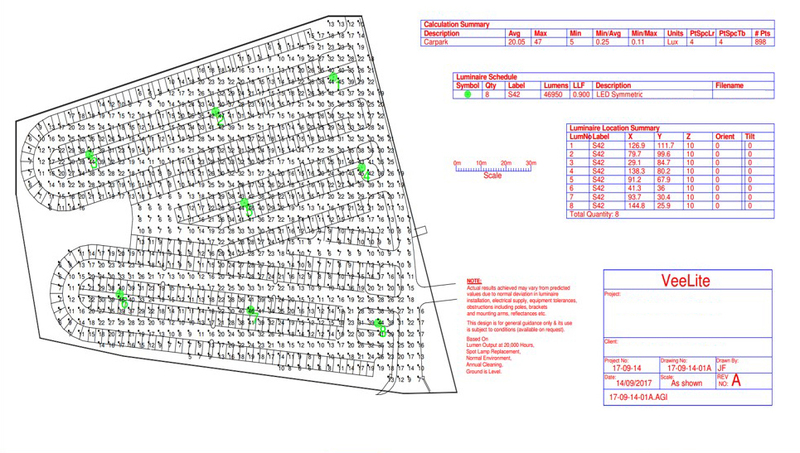 We have staff trained and qualified to provide public road lighting calculations. In addition, we use the software specified by the Local Authorities. This is in addition to our main Lighting Design software. This Local Authority lighting design software enables the Local Authority to take our calculations and edit or compare them in-house. Finally, the Products we supply are to Local Authority requirements. This is one of the most popular green building certification programs used worldwide and Lighting is a part the LEED assessment. The intention is to eliminate or minimise light spill and pollution and to assist with dark skies. We can provide lighting calculations for LEED Projects and help achieve these certifications. An example calculation is attached below. We can advise BUG ratings for all our Luminaires. For Further Information on LEED – see US Green Building Council (USGBC).